You are a genius, sir. Thanks for posting that nugget. You’ve saved me literally hours of jumping down to the trackpad and back up again. Allow you to give me one internets. just use +. to cancel any dialog box. sytem wide. 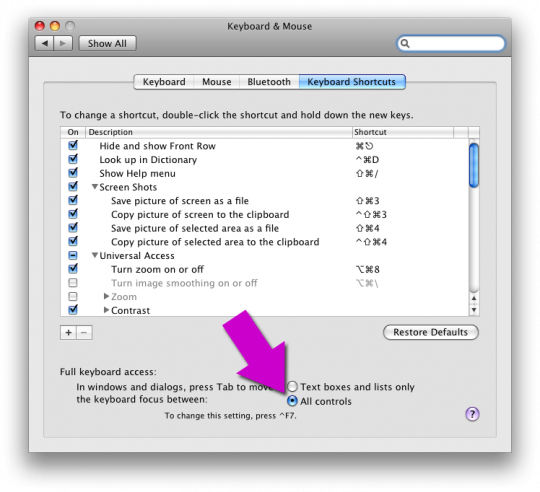 This stopped working for me when I upgraded to 10.6 – toggling to “text boxes..” then back to “all controls” seemed to fix some programs but not others – odd. Better but still not as friendly as windows where I could respond to the dialog with single keystroke and without messing with tabs. Usually just ‘Y’ or Alt+Y to respond Yes and so on. Thanks! The tip was helpful! It was getting to the point of irritation!